Yesterday we reported on new information on Lillian Collier , the flapper we’ve been talking about for years. Lillian ran an outfit called The Wind Blew Inn and was the darling of Chicago bohemia in 1920-22, and in 1925 gave an interview saying that flappers were not “savages,” but evidence of a new era of freedom for women. This was a few years after the Inn was raided for holding “petting parties,” leading her to assure a judge that “there is no snugglepupping at the Wind Blew Inn” (he sentenced her to read a book of fairy tales to cure her bohemianism) (it doesn’t seem to have worked). I’ve written about her in several Chicago history books, including the upcoming Chronicles of Old Chicago. We still don’t know what she was up to after 1925 (update: we do now!) but having found out that her maiden name was Lieberman has helped find a few more pieces of the puzzle to add to the mix. We know she was born in New York in 1901 (probably Sept 16). We know she and her family were in Baltimore in 1910, then apparently back in New York just before their time in Chicago, which began in 1919 or 1920. Some of the family appear to have remained there all their lives, some may have moved on. In any case, one fascinating new thing I found is an essay that Lillian’s mother, Nellie, wrote for a contest the Baltimore Sun had in 1912. 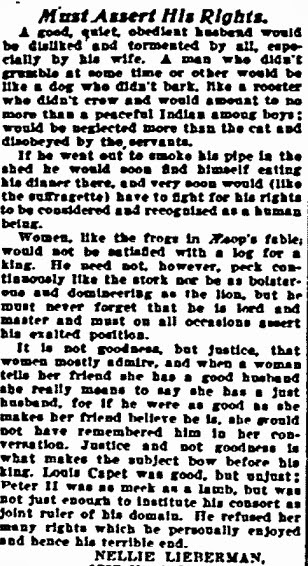 The subject was “Do Women Want Good Husbands,” and Mrs. Lieberman’s entry is a fascinating document. The “husbands should be assertive and noisy” sentiment is balanced by a demand for equal rights and equal treatment; is this what feminism looked like a century ago? The address below (cut off here) corresponds with their address in the 1910 census, so I’m sure this is the same Nellie Lieberman who accompanied her daughter Lillian to court in 1922. Nellie and her husband, Meyer, were apparently divorced in 1921. Lillian herself seems to have won a children’s poetry contest in the same paper in 1916, but I haven’t found her poem yet (the scan of the paper from the day it was probably published is messed up in the only source I know of for Baltimore Sun papers from that year). It was in the “Yarns for Youngsters” section, and she would have been 14 at the time. Like Homer Simpson in the “design a Nuclear Power plant” contest, she may have been in a contest with children, but she kicked their butts! update: we now know that she went on from her juvenile poetry contest success to a career writing mystery novels, a couple of serious “literary” pieces, a play produced on Broadway, and even a bit of Chicago true crime in the 1930s and 40s. See our update!